To begin with, this is not the usual formula for a Sherlock Holmes book. In fact, Holmes appears in the book almost as an afterthought. The book centers mostly on the character of Dr. Maurice Verner. 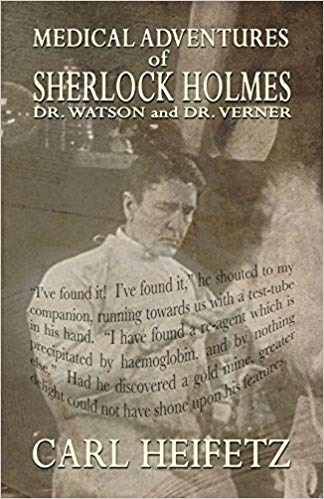 Dr. Verner is the cousin of Sherlock Holmes that purchased Dr. Watson’s practice after the death of Mary Morstan Watson. The stories appear to be the property of the Verner family. They are usually introduced by being read by Maurice Verner, a descendant of Dr. Verner. The Verners have taken the original 221B sitting room and transferred it to their business headquarters, said to be located in a warehouse on the Detroit River. The mysteries as per the title, revolve around mysterious deaths that have medical explanations, such as Tapauli Fever, Ergot Poisoning, Bubonic Plague, Tetanus and so on. A Holmes fan will find familiar names, situations, and places. But the stories don’t really ring true to a Holmes mystery. For example, it is hinted that Sherlock Holmes is not the real name of the Great Detective. I took it to mean that perhaps Holmes was being used as a fictional way to tell the stories of someone else. Dr. Joseph Bell is mentioned in passing. Bell has long been supposed to be the man Conan Doyle based his hero on, due to the man’s keen observation and deduction. Just a thought, maybe this is what the author means by his statement. Honestly, I didn’t like the book much. There are bright spots, such as the means of detecting Ergot Poisoning, but overall the stories were—blah comes to mind. These stories have little beyond cold fact to try to capture the reader’s attention. They might do well as essays on medical mysteries, but as stories, they fall a good deal flat.